Platform games were plentiful during the 16-bit era. 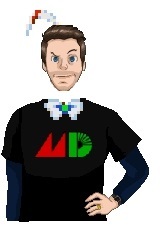 But with their unique ideas and mastery of the Mega Drive, could Treasure’s contribution to the crowded genre be something truly special? As someone who regularly writes thousands of words on old games, I do occasionally wonder if I’m ever in danger of over-analysis. I’m a firm believer that game developers, even thirty years ago, put thought into what they created. Yes, some games may well have been the result of designers throwing things together and seeing what sticks: the abstract nature of the ‘James Pond’ and ‘Paradious’ series are certainly guilty of this. Yet equally there are games where subtle nuances and seemingly inconsequential oddities meld together into a convincing theory. For years many claimed that the game ‘Super Mario Bros 3’ was actually depicting a theatrical production starring Mario. 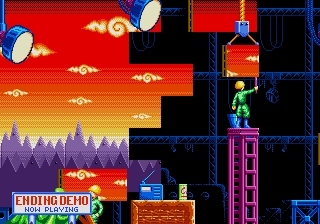 It opens with a curtain raising, stages end with Mario “exiting stage right”, background blocks have shadows and floating platforms are hoisted up by cables suggesting they hang from a theatre’s lighting rig. Some people scoffed at this idea, arguing that theorists were finding a truth that simply wasn’t there. But it was ultimately the cynics who were made to look foolish when, in October 2015, Mario designer Shigeru Miyamoto addressed the myth on Twitter. When asked “Was ‘Super Mario Bros. 3’ all just a performance?” His response was an enthusiastic nod of “Yes”. 6 years after the release of ‘Super Mario Bros 3’, another game took centre stage and was much less subtle about its theatrical influences. ‘Dynamite Headdy’ is a platformer developed by Treasure, their spiritual successor to the incredible ‘Gunstar Heroes’. Set in the Treasure Theatre, the game follows a marionette named Headdy as he attempts to stop the Dark Demon from turning all the puppets of the world into his evil minions. Meanwhile, Trouble Bruin, a cat/bear like Puppet wants to be the star of the stage. Jealous of Headdy’s popularity he has decided that if he “ can’t get his goal by winning the hearts of the audience, he’ll do it by doing away with headdy!” Unlike ‘Super Mario Bros 3’, references to the action taking place on a stage are hardly subtle. As levels progress stagehands rush in changing the backgrounds, obstructions hang from strings or they’re bolted into place. 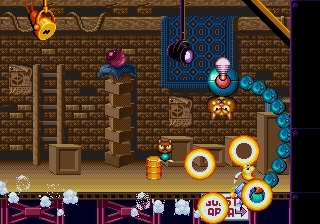 curtain-falls signpost transitions between levels and Headdy’s energy gauge is depicted by a spotlight in the corner of the screen. on occasionally gameplay even shifts to a backstage area, complete with all the support structures, ladders, discarded props and dressing rooms you’d expect to see in a theatre. A player will also come into contact with the orchestra responsible for the game’s incredible soundtrack: An eclectic mix of classic melodies mixed with more frantic upbeat numbers that really push the Mega Drive’s Yamaha YM2612 sound chip. However, unlike Miyamoto‘s ‘Super Mario Bros 3’, the theatre aesthetic wasn’t the result of extensive planning and forethought. ‘Dynamite Headdy’ was created by many minds with each bringing fresh ideas to the table. “in our company, the role of planner did not exist” says Masato Maegawa, president of Treasure, who also served as the programmer. ”The game evolved as the team threw around ideas – everyone, from designers to programmers, was involved.” Retro Gamer accurate describe the company’s philosophy as “the kitchen-sink approach”. The problem is that the game design like this rarely feels particularly cohesive and in ‘Dynamite Headdy’ everything feels random and abstract, for better or worse. Western audiences, in particular, will likely be very confused. without an explicit story, You go through thereaditional platform running and jumping without really knowing why you’re doing it. For example, Headdy is clearly in love with another puppet as when they cross paths hearts appear, but why she keeps running off with a key is a mystery that’s not even explained in the instruction book. The game is filled with creative ideas though and every level introduces a new element. By the game’s close you’ll have enjoyed side-scrolling shooter style stages, ‘Nebulus’ inspired tower climbs and you’ll even have dabbled in a basketball mini-game. But the highlight of the game is, of course, fighting against the various screen-filling bosses, each with their own attacks and weaknesses. 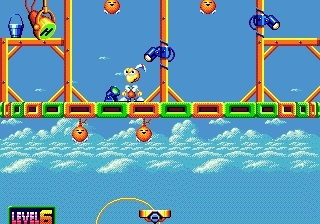 Defeating them requires mastery of Headdy’s rather unique attack; launching his own head at foes. According to Masato Maegawa, the game was built around the head throwing mechanic. “With ‘Dynamite Headdy’ the central inception of the swappable heads was decided right at the beginning of the planning stage”. 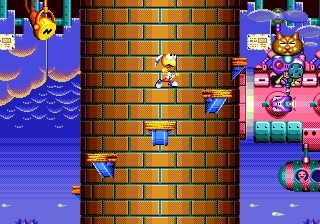 During his adventure, Headdy will find power-ups which change the look and function of his head, similar to the mask system found in ‘Kid Chameleon’. Each of the 14 power-ups offers a different upgrade including increasing damage, granting the ability to climb walls, offering fireball shields, providing invincibility, restoring health and increasing speed. But amongst the upgrades there is also the risk of a negative effect; touch the Head Trip power for example and “your head becomes so big and heavy that it’s difficult to move around, and it’s easy for your enemies to stomp on you “. The Pin head shrinks you and The Vacuum head draws all enemies closer; which is both a blessing and a danger. Some of these are integral to solving light puzzles within the stages, while others are just there for a little extra firepower. The attractive visuals won’t come as a surprise to anyone who’s played a Treasure Game; the company were known for squeezing every pixel out of the Mega Drive. “Since their formation in 1992 Treasure were renowned for two things; intense action-packed gameplay and visuals that were a real treat for the eyes,” wrote Gamasutra.com. “We weren’t consciously trying to push the hardware – we were just having fun trying out new ideas and creating interesting game mechanics within the limitations of the console” Masato Maegawa said in ROM Publishing’s ‘Sega Mega Drive - Collected Works’. “Explosions and other effects were not really about the tech but more about our personal taste”. Headdy himself is beautifully animated, but not at the cost of the game’s speed. Character Animations blend fluidly into one another creating a protagonist full of life and charm. But the real visual masterstroke is the environments. Masato Maegawa explains that they incorporated the same approach they had used on the previous Treasure games. “At first we were drawing the backgrounds with a single palette of 16 colours, but we thought the results looked too sad and desolate, so I requested that we draw scenery with two palettes, giving us 32 colours to work with, which is what we ended up doing.” The stages are vibrant and detailed and, thanks to them being set in a theatre, any repeated backgrounds feel like a deliberate design choice. There are so many incidental features, that aren’t necessary but do breath life into the game. Techniques learnt on ‘Gunstar Heroes’ have also been repeated here, including a large “faux-3D” bosses made up of scaling spheres, and rotating block floors that appear to burst out of the screen. “Characters swarm around in the background and foreground, elements of the environment twist, turn and constantly Frotate, the whole thing moves at a lightning pace” notes IGN. According to Retro Gamer magazine it “was a spectacle of some note [at the time], its impact almost measuring up to the feats of contemporary FX chip-powered games over on the SNES”. Masato Maegawa believes the company’s celebrated visuals were the result of embracing a console’s strengths rather than mourning its shortcomings. “Compared to other game consoles at a time, the [Mega Drive’s] 68000 processor was very powerful and capable of generating sophisticated effects. we were pleased to discover, that by being creative we could make platforms perform X, Y and Z axis spins, so integrated a lot of these effects into our games”. The end result stunned critics at the time and it’s impossible to read a review and not see references to the game’s splendid visuals. Tellingly, the game has been ported to many recent mobile systems and at a time when pixelated graphics are very much in vogue, ‘Dynamite Headdy’ looks as impressive today as it did more than twenty years ago. Throughout the 16bit era, it wasn’t unusual for games to see dramatic changes when released in different global regions. During the nineties, players were less comfortable with the quirks of Japanese culture. As a result, anything that was considered too alienating was altered to be more in-line with local tastes, censoring things that may be seen as taboo or offensive. For ‘Dynamite Headdy’ the changes were comprehensive and were largely detrimental to the experience as a whole. The most significant change was the removal of the majority of the in-game text, which would explain a westerner’s confusion when trying to understand what’s going on. For Japanese players, meeting a boss triggers a conversation. For English speakers, most of this has been removed and in so doing much of the game’s charm and wit has been lost. To compensate, Stage names were changed in the international version to add pop culture references. Sadly these now age the game terribly as Disney’s ‘Rocketeer’ wasn’t particularly successful or memorable. Throughout the stages, there are also numerous visual changes, some logical (like adapting graphics containing Japanese characters) others seemingly arbitrary (like palette swaps for bosses). 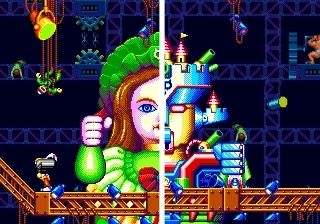 Notably, the Geisha and Kimekomi doll bosses were redrawn as robots. This could either be to disguise the game’s Asian roots, or perhaps its to avoid making the player have to harm women. This explains why outside of Japan, a once difficult game has become an incredibly frustrating one. For example, not only does the Japanese version start the player with two continues it’s easier to earn additional ones. For those playing anywhere else in the world, you start with no continues. so losing your lives returns you, frustratingly, back to the start of the game. End of stage bosses are also notably harder for western players, as they have far more dangerous attacks and less predictable patterns. Some can even take twice the amount of damage, with smaller points of weakness. That’s presuming you can even get through the stages now that’s there more and faster-moving enemies. While it may have meant Those renting ‘Dynamite Headdy’ couldn’t finish the game in a weekend, Masato Maegawa and his team really went too far: practically no one can finish the game at all within any length of time. “It's a Treasure game, so of course it's ridiculously difficult” notes Retro Gamer in a retrospective article. If you’re a traditionalist who will only play games using an original cartridge on a legacy machine, you’ll need patience and a lot of luck to see the ‘Dynamite Headdy’s ending. However for those willing to dabble in the murky world of emulation the best way to enjoy this game is to take advantage of M.I.J.E.T’s translation patch. 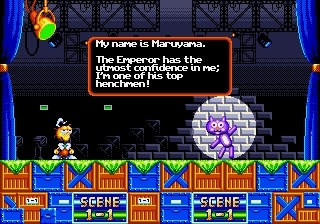 As the creator admits “‘Dynamite Headdy’ was one of those great games that unfortunately went through a process known as “localization”. Nearly all the dialogue was removed, and what little remained was changed. Furthermore, many of the graphics were modified and this already challenging game had its difficulty level pumped up significantly.” By using this patch you’ll get to enjoy ‘Dynamite Headdy’ in the way that Masato Maegawa and the Treasure team originally intended. It’s still a challenging game, but it never feels insurmountable. The additional text doesn’t completely clarify the story, but it does at least make a little more sense. ‘Dynamite Headdy’ doesn’t top ‘Gunstar Heroes’ but it does show that Treasure could push the Mega Drive. But Their “anything goes” approach to game design may not be to everyone’s liking. For example, Games Master magazine’s Tim Tucker found the impressive colours, big explosions, large sprites, and rapidly changing backgrounds overwhelming and patchy. However, Electronic Gaming Monthly calls ‘Dynamite Headdy’ a rollercoaster thrill ride of a game, so the frantic pace is certainly an acquired taste. Shigeru Miyamoto may have created games that kept game theorists puzzled for decades, but sometimes it’s exhilarating to have a visual and audio bombardment; where every stage offers a new challenge and nothing stands still for long. It may not make complete sense, it may be silly and frantic but that’s just Treasure’s way. ‘Dynamite Headdy’ is a unique take on the tried-and-tested platform game and at a time when this genre was prevalent, it’s all the better for it. ‘Dynamite Headdy’ is one of those games that’s sat on my shelf for a while, I’ve known it’ll be good but I just hadn’t devoted time to play it. It’s hard to muster up enthusiasm when effort doesn’t yield progression in the game. Originally it was given to me as a gift for my birthday.